Let’s be honest, we all love our pets. Whether you have a dog, fish, guinea pig, rabbit, ferret, horse or cat there’s nothing we love more than spoiling them with treats, toys and our favorite; cuddles. However, cats are by far the most elusive pets of them all. When the Egyptians ruled the planet, they used to worship cats. And we can kinda see why. These incredibly majestic creatures go about their day as if nothing could ever hurt them – and we dig that. Although we moan when our cats rock up with dead birds or mice, the Ancient Egyptians praised cats for controlling the vermin in Egypt. In fact, the Egyptians even worshipped the Cat Goddess; Bastet. Unfortunately, we don’t treat them as Gods or Goddesses anymore (although they’d probably love that). Owners always make sure they have everything they want and are well looked after – and they soon become part of the (slightly dysfunctional) family. It’s no secret that cats and dogs don’t exactly get on – I mean, just look at Garfield and Odie! However, many owners often find their two favorite pets engulfed in a full-on turf war for love, affection, and power status. Just like these two. 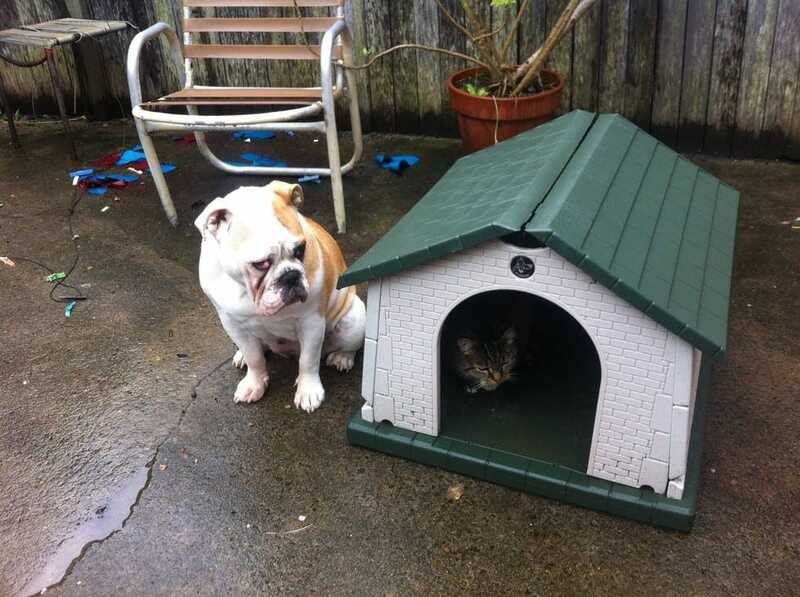 The kitty wanted the dog house, so the kitty fought her way in and overpowered the doggo. Of course, this does mean the bulldog had to pack his things and move out… but who cares? 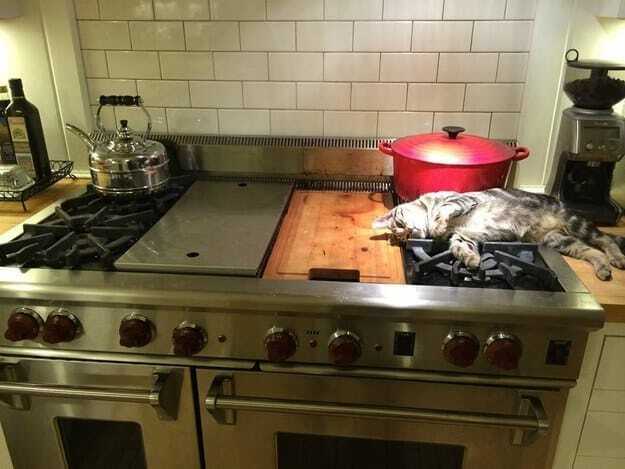 For some reason, cats just hate to follow instructions. Whether it’s their selective hearing or the fact that they get a kick out of causing mischief, we don’t know. 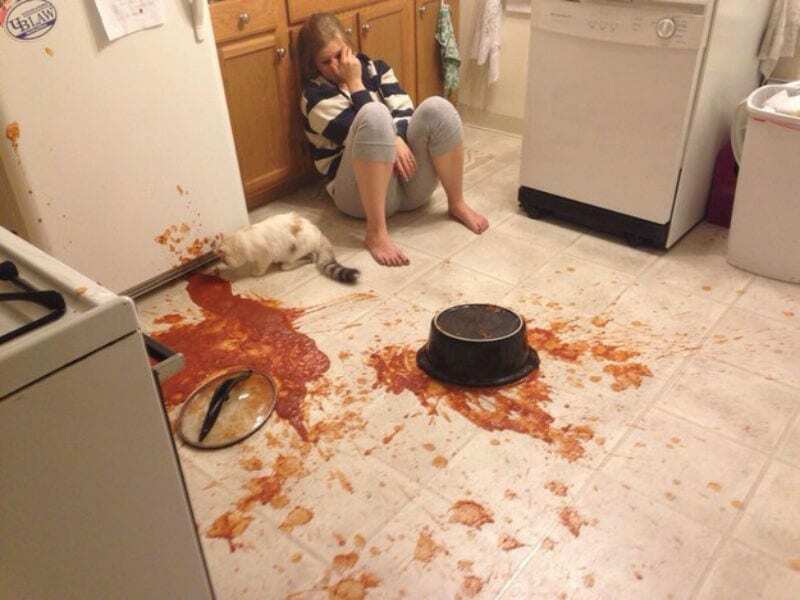 So when this lady asked her cat to keep away from the kitchen worktops, she thought the food she had spent hours tirelessly making would be safe. 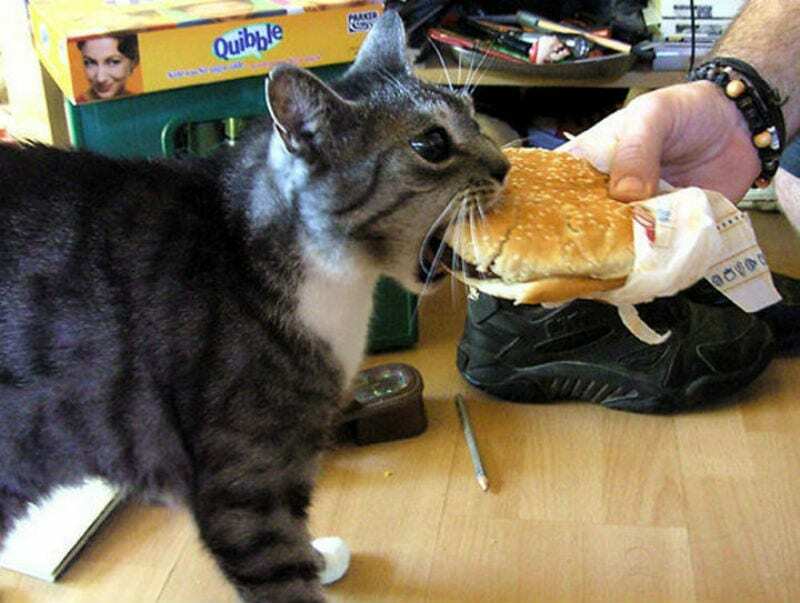 Unfortunately, the cat thought it was above the rules, and decided it was really, really hungry. You know the rest. Her face says it all, really. If you share your house with any animal, you’ll know that sharing is just a part of everyday life. Yep, nothing will ever be yours in a house full of pets. Most of the time, we don’t mind sharing our belongings – but it’s a different story when it involves food (especially burgers). Just like Joey from Friends, we do NOT share food. However, cats can be incredibly persuasive, and we normally lose the battle. Bye, lovely burger. When it comes to cats, there’s a hierarchy a little like high school. There are the popular kids who just ooze coolness, and then there are the not-so-popular kids. 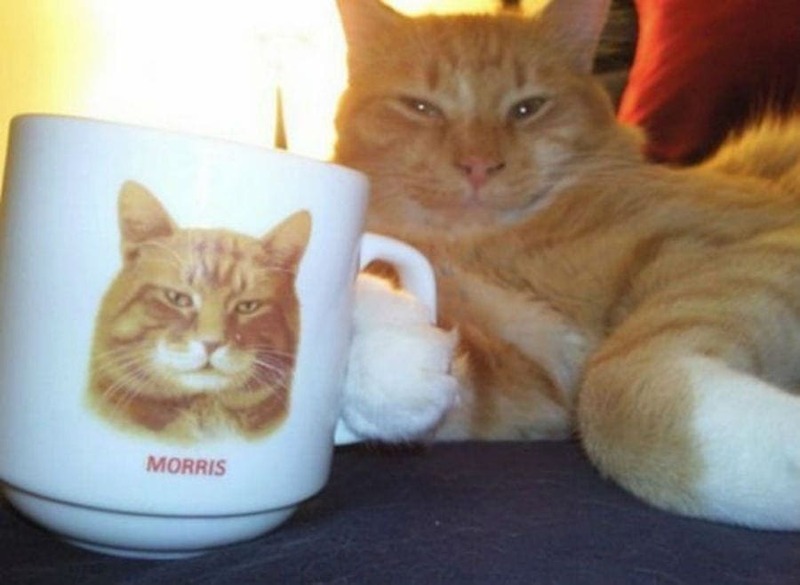 Well, we think you’d all agree that this kitty-cat is the epitome of cool. 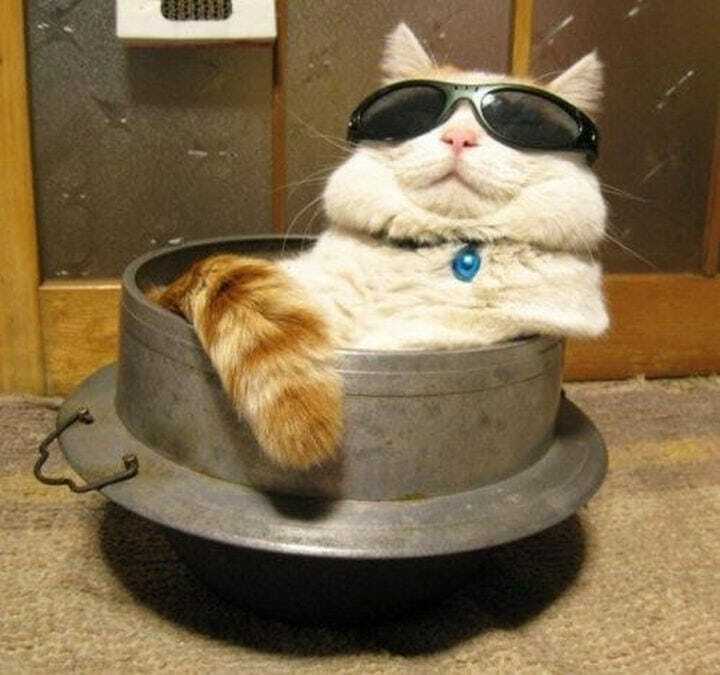 He’s got the shades on; he’s rocking the traditional ‘If I fits, I sits’ motto, and he’s got a look on his face which screams ‘Just look how cool I am. I know you’re jealous.’ We want to be his friend. All moms and dads worry about their teenage children. 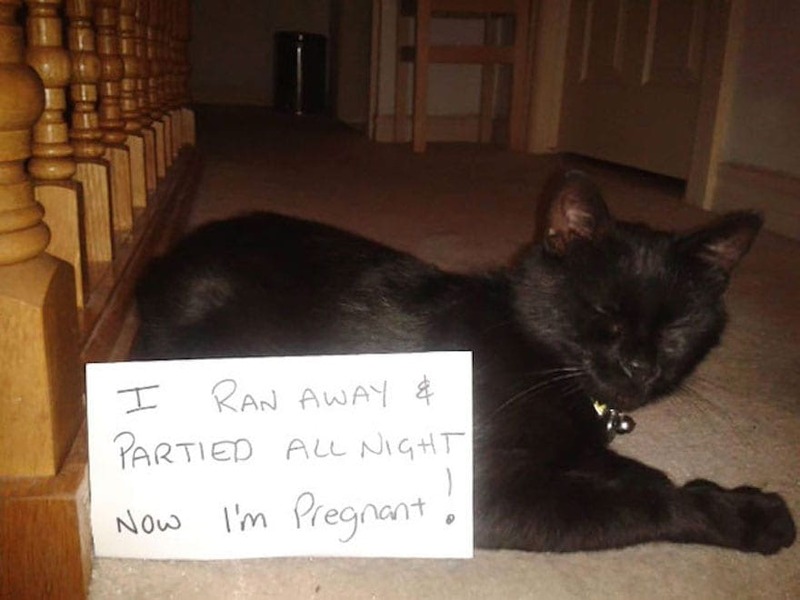 They party, they stay out late, they get drunk, and they do just about everything they tell their kids not to do (yep, that’s the way it works) – but one thing they worry about is their kids running away, partying all night and ending up pregnant/getting someone else pregnant. However, while these parents were so busy focusing on their kids, they forgot to keep an eye on the cat. Uh-oh. If you’re thinking about getting a cat, you need to know one thing; they need attention. Like, all the time. Cats are some of the most fickle creatures because one minute they want nothing to do with you, and the next minute they’ll interrupt your game of Pokemon, demanding attention from you. 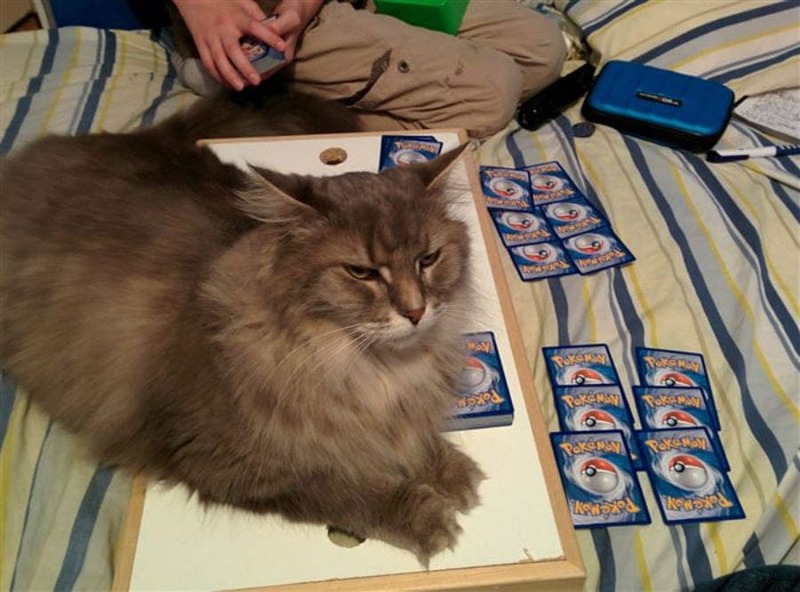 Cats have no time for silly human games. Cats play their own game where they call the shots, and they ALWAYS win. 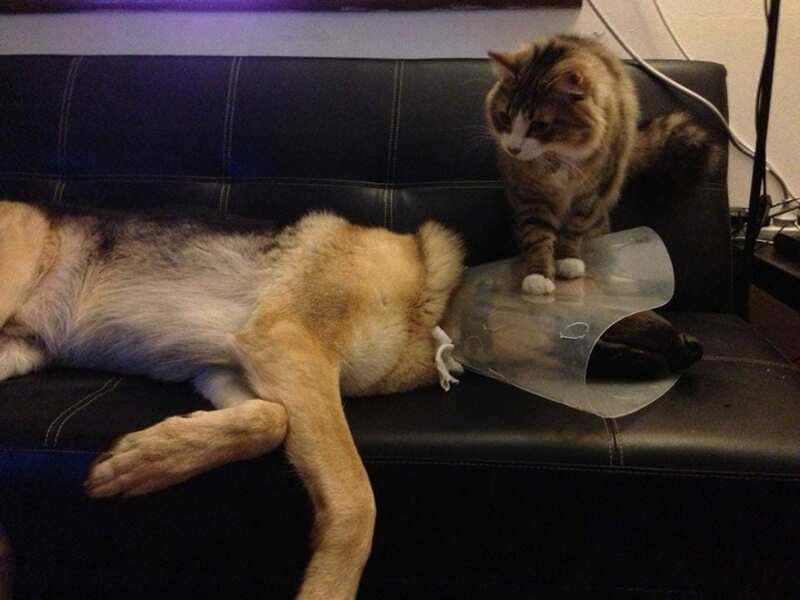 The cone of shame is shameful for any animal – and it’s probably fair to say this dog is probably already feeling a little worse for wear (or is just having a really, really good nap). 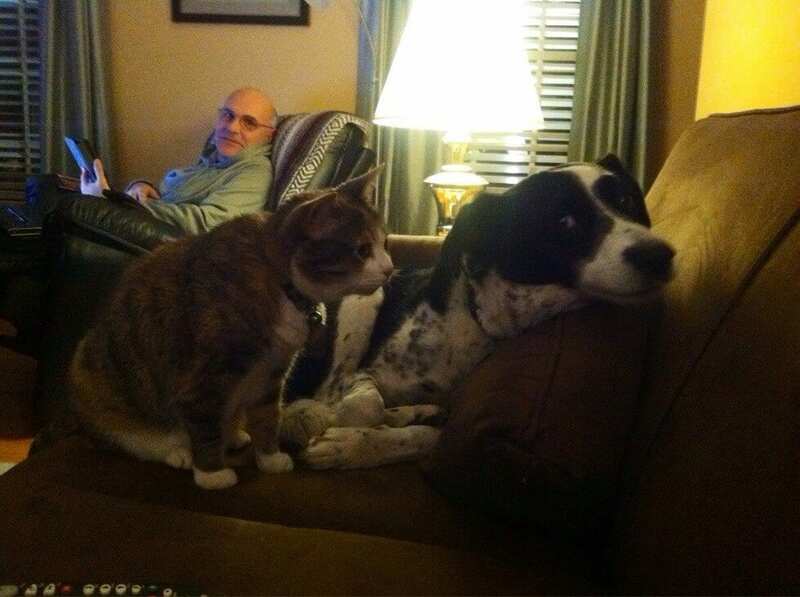 However, this cat doesn’t feel sorry for the dog. Oh, no. This just gives it the chance to prove once and for all that cats reign supreme. You feel ill, dog? Well, that’s too bad. Perhaps it will make you feel better if I just stand on your head? If there’s one thing we admire about cats, it’s their incredible ability to fit into every tiny space and make themselves super comfortable. 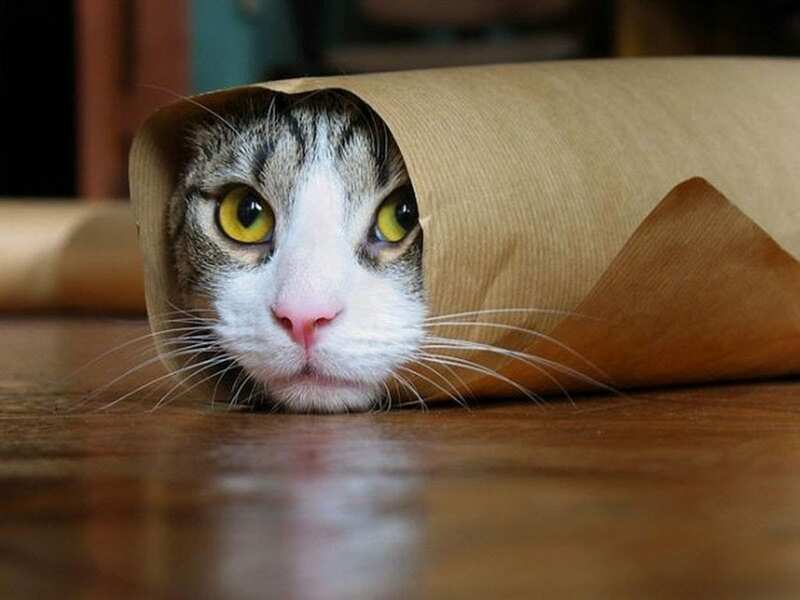 And this guy is rocking the Purrito look. This way, he can hide from his owners and get a good little cat nap in while the humans are still in the house. They’ll never find him. Although we do hope nobody is actually hungry for a burrito, as they could have a nasty surprise. If you have brothers and sisters, you’ve probably engaged in a little sibling rivalry every now and then – and it’s exactly the same with cats and dogs. And just like us, it’s all about who gets the remote, who gets the last candy bar, who gets to ride shotgun on the way to the mall, and who gets the comfiest spot on the couch. This cat just isn’t backing down. It wants that spot. Cue the evil eyes. After a long hard day of searching for mice, laying out in the sun and not really doing a whole lot (I mean, what do they DO all day?!) cats get pretty tired and need a little cat nap. 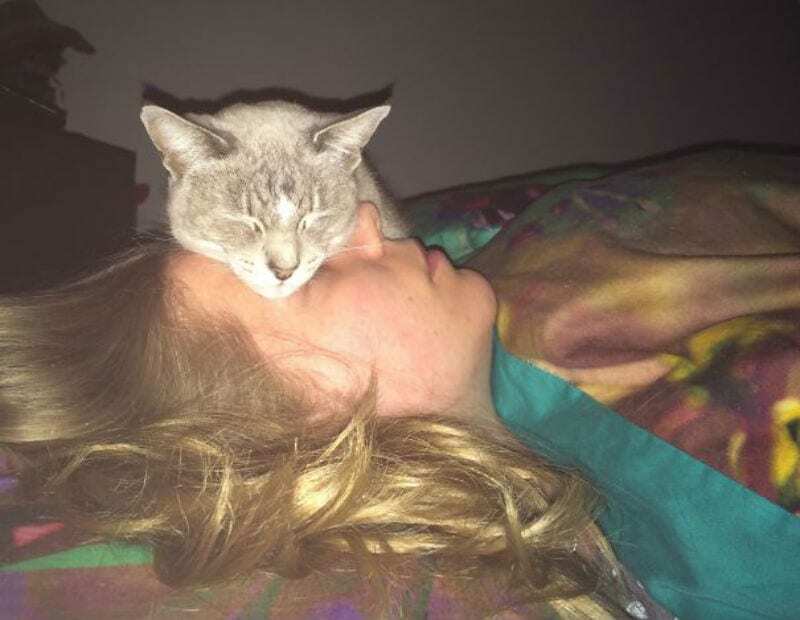 Just like us humans, cats need their beauty sleep, and it’s absurd to think that they can just sleep anywhere. 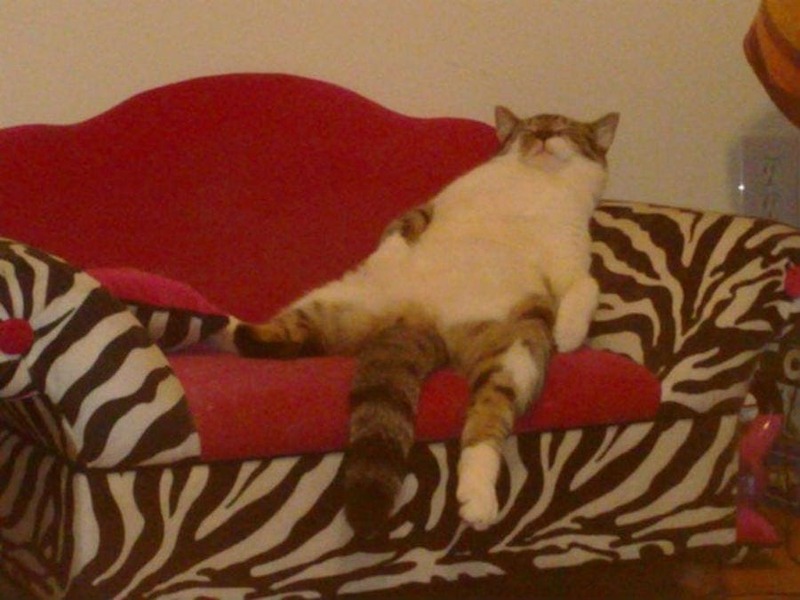 Of course, all cats need to spread their paws and chill out on their own personal zebra-print chaise longue. Obviously. 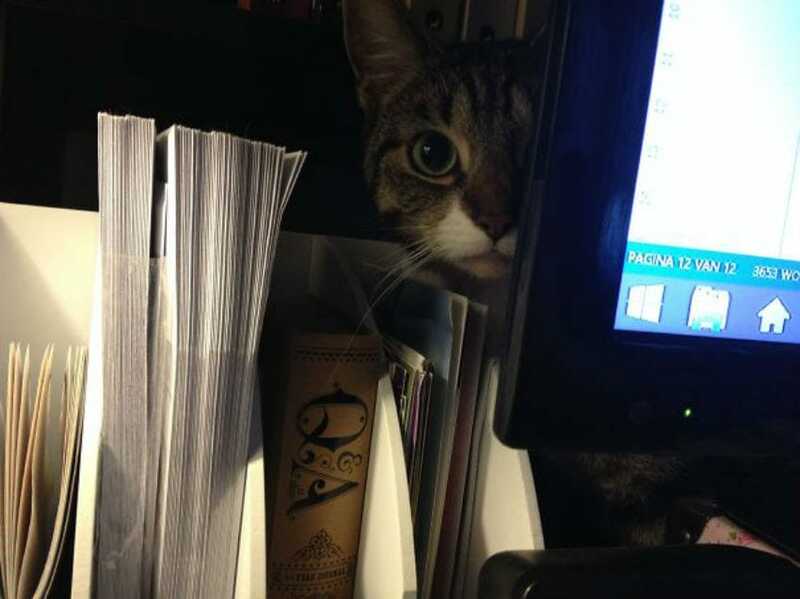 Although cats mostly go and do their own things during the day, they can often make rare appearances at home – and because they’re incredibly loyal, you might be able to persuade them to help you out in your office. 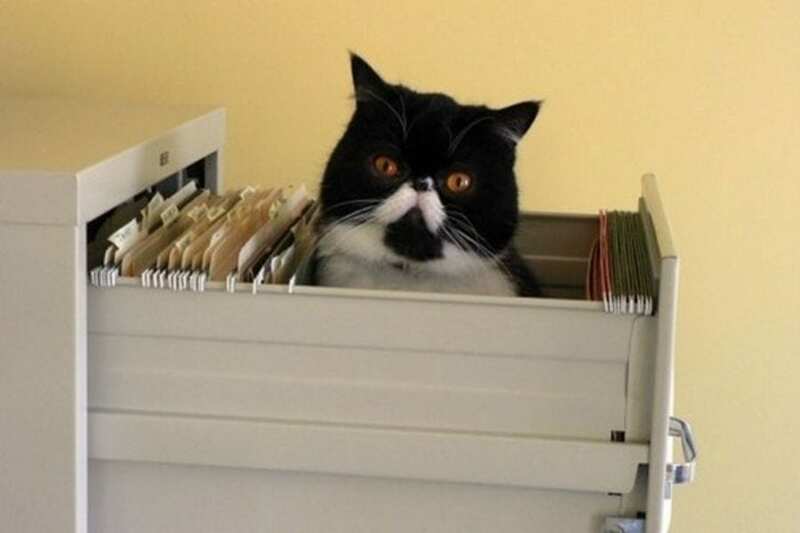 However, this cat got a little bored helping its owner out (don’t blame him, paperwork is soooo boring) and thought he’d take a little break in the filing cabinet. 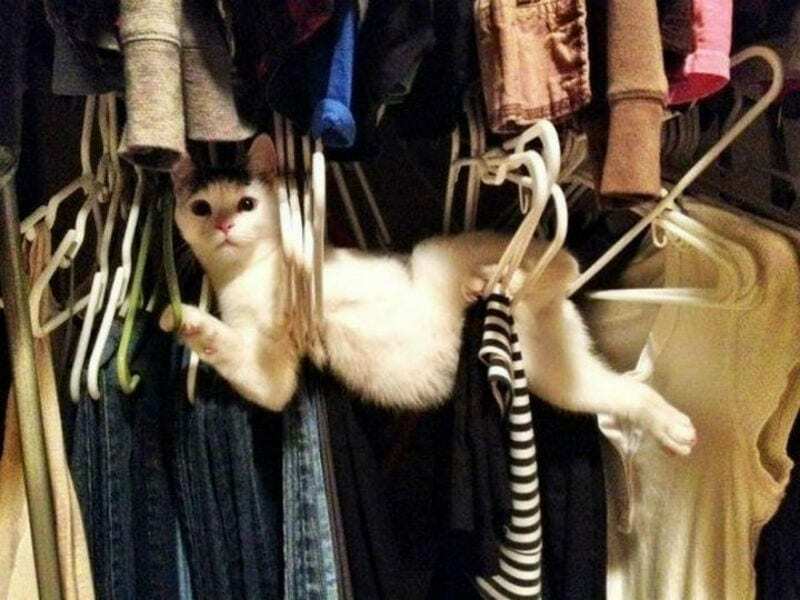 At least this way he can pretend to be busy if his owner catches him. Alongside being incredibly cute, adorable and fluffy (sometimes), cats can also be incredibly scary. They turn up in the most unlikely of places, they’re the masters of disguise – and they’re always watching. This can prove pretty darn terrifying for the unsuspecting victim who has to endure its wrath. Yes, your cat is probably plotting your demise in a slow and steady fashion, but the chances of that actually happening are pretty slim, so don’t worry too much. You’re all good. 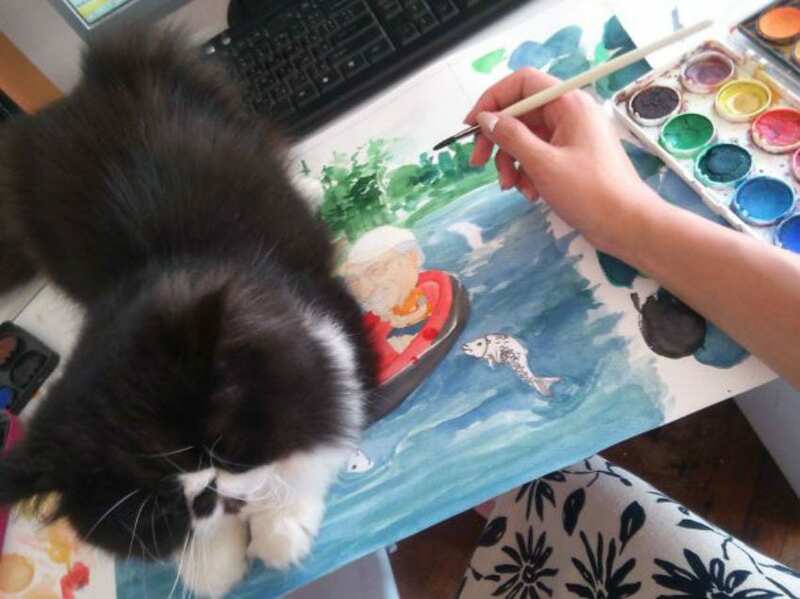 You can guarantee that if you have a hobby before owning a cat, you probably won’t get the chance to carry it on – unless you want cat hairs all over your painting or a big blue splodge of paint on your canvas. However, this incredibly annoying space invader is just showing you they care, and that they appreciate your love and affection. It’s kinda cute, really. Maybe you could be a specialist cat painter instead? Ahhhh, the classic photobomb. 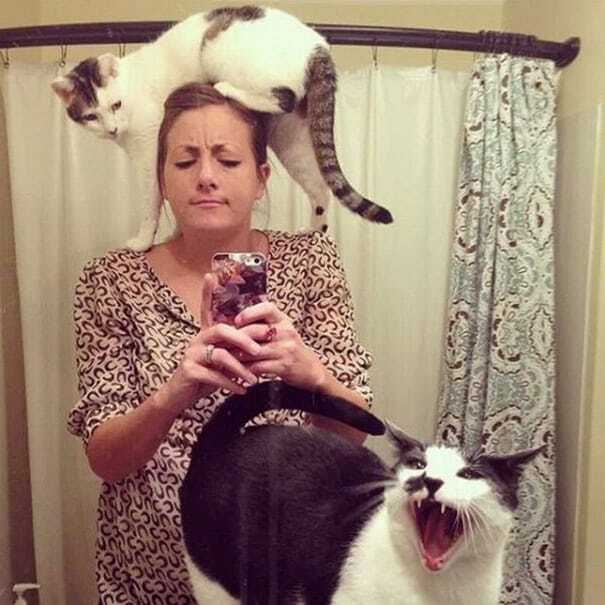 There’s nothing we love more than taking a good mirror selfie – but when you have cats, it’s just not possible. Cats will follow you wherever you go and want in on every piece of the action. These cats wouldn’t miss the opportunity to show their owner who’s boss by finding the perfect place to rest their legs and show their big smile to the camera. That’s one to put in the family photo album. The figures are in – and naughty kitties are on the rise. Now more than ever, cats are getting a little too big for their boots and thinking they are the biggest and baddest kitties on the block. This means owners are tightening up their parenting skills and making sure their cats are being punished. 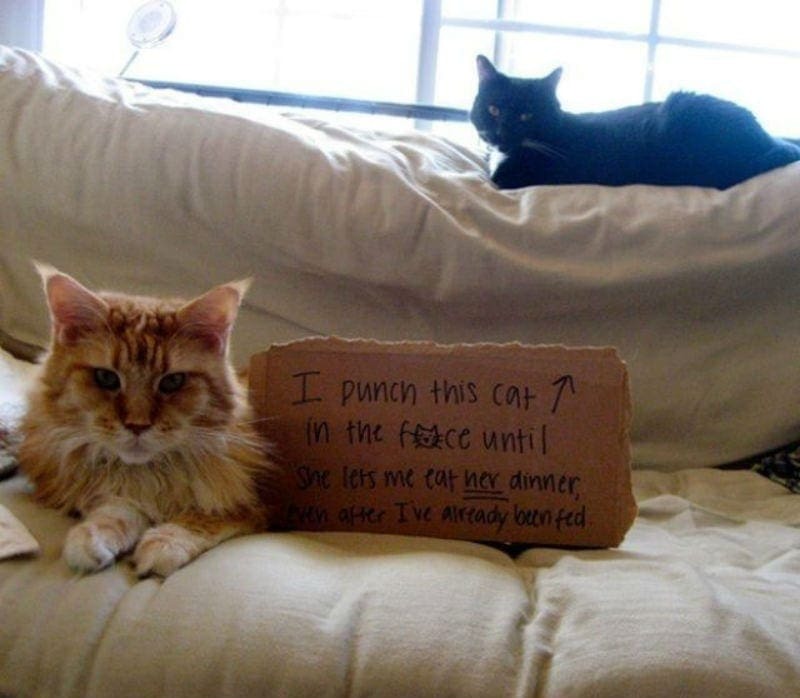 This cat probably won’t punch his sister in the face and steal her dinner again after this embarrassing public shaming. For shame. If you own a cat, you’ll know that there’s no chance of you having any privacy when they’re around – because they want to know EVERYTHING. And we mean everything. 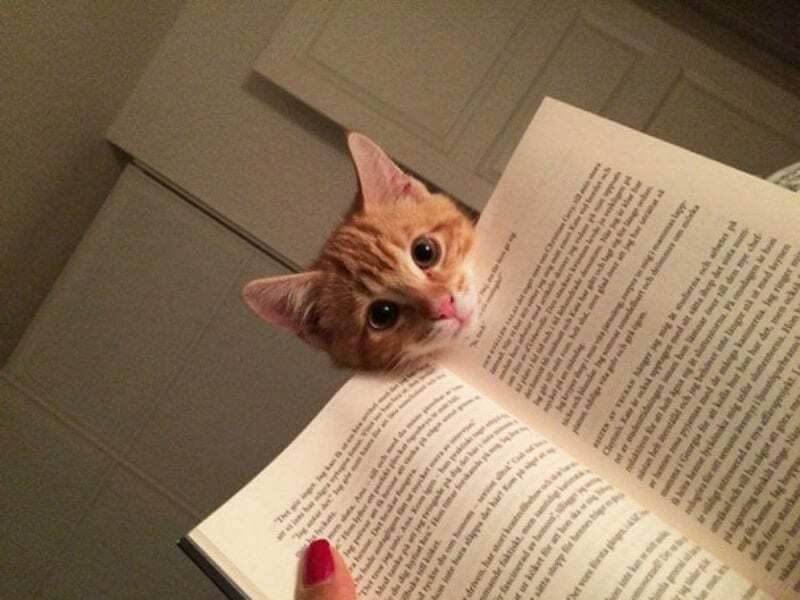 Cats don’t have time to read the whole darn book, as they have more important things to do. Instead, they want you to skip right to the end so they can find out what happens. Be strong, humans. Don’t let them win. (But of course, they always do). When they’re not ripping up your brand new couch with their claws and bringing dead birds onto your kitchen flaw, cats can make the perfect companions – especially for children. There’s nothing better than a good cuddle off your kitty to make all of your troubles go away and focus on nothing but the big ball of fur in front of you. And these two have got that just right. 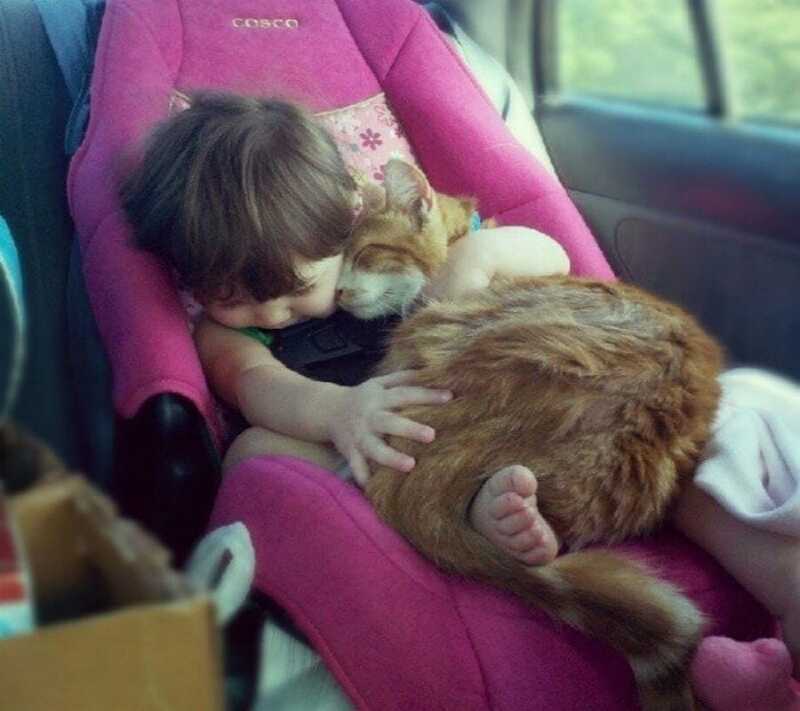 Kitty cuddles will make any boring car journey instantly better. 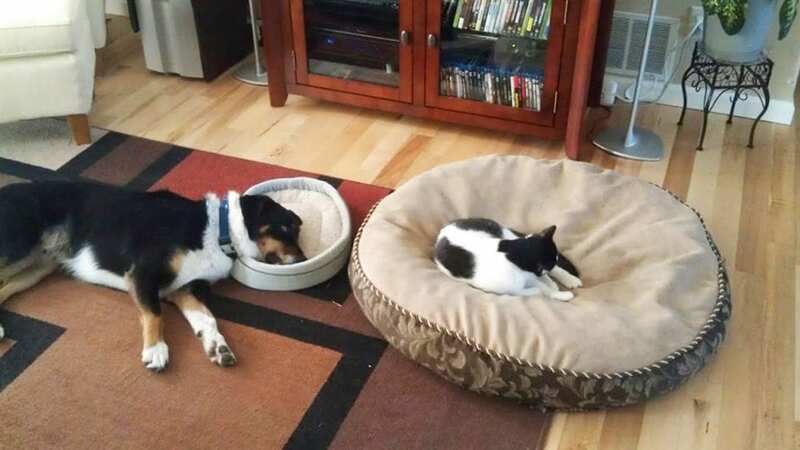 We all know it’s not all about size (thank goodness) but cats and dogs play by different rules. 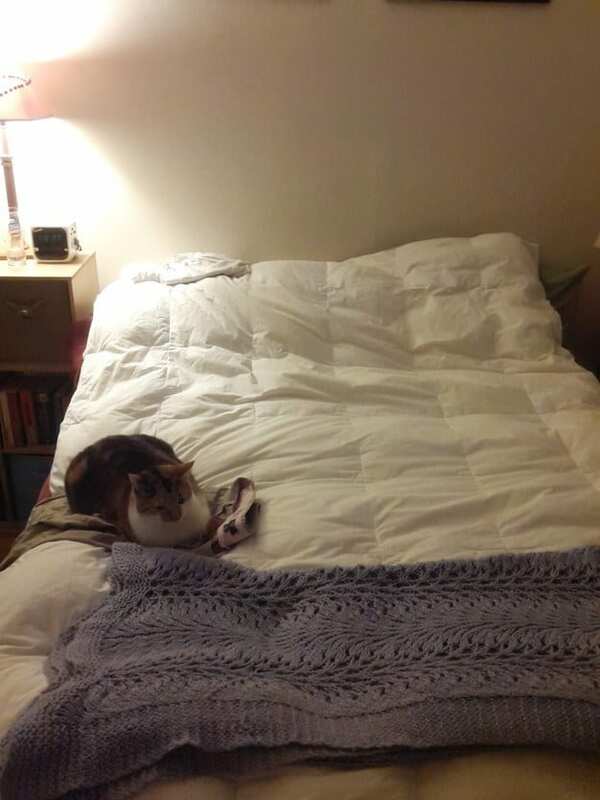 For cats, it is all about size – because the smallest always gets the big bed. So don’t bother spending hours looking for the perfect sleeping bed for your cat, because it’ll just steal the dog bed, and your poor dog will be demoted to the tiny cat bed which barely fits its head. 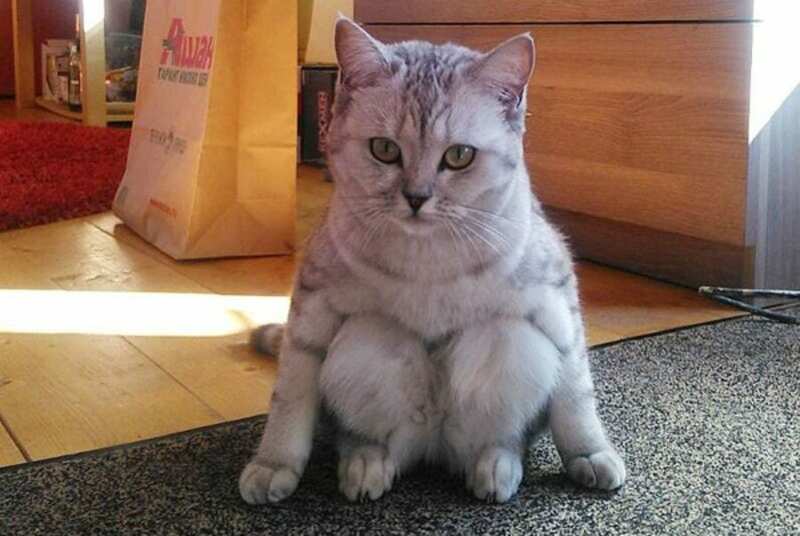 Well, cats do need space to stretch out, y’know. Sometimes we really wish we were a cat. What could be better than being able to sleep anywhere and everywhere? 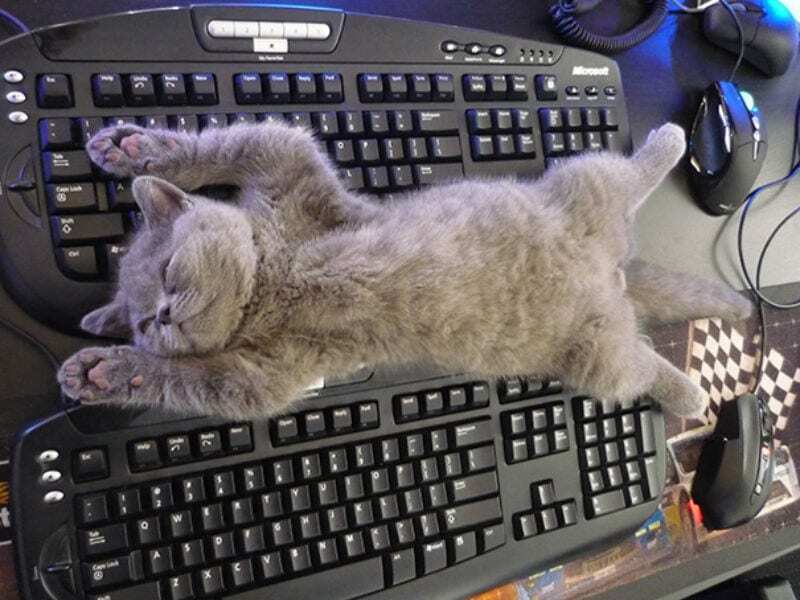 However, this incredible ability can often prove detrimental to your work life – because you’ll normally find your cat sleeping in the spot that you need to use; like your keyboards. I mean, is this guy even asleep? Are his eyes open? Is he just trying to ruin your life and get you in trouble with your boss? Probably. If there’s one thing we’ve learned about having a cat, it’s that there is nothing that is categorically your property. Everything that you own and everything you buy is automatically shared with your cats, whether you like it or not. This means that you may often have to share a bed with your beloved fur ball. Sometimes, you may have to resort to the couch as the cat has taken over the whole bed. The cat decides. There’s nothing we love more than a super cute kitten – and this one really is something special (just look at that little face). However, cats really don’t understand personal space. This can be a bit of an issue when you really do need a little alone time in the bathroom. Unfortunately, this kitten doesn’t get that notion and wants to stay with its favorite person. Ah, we wish we could be annoyed, but this is just too adorable. 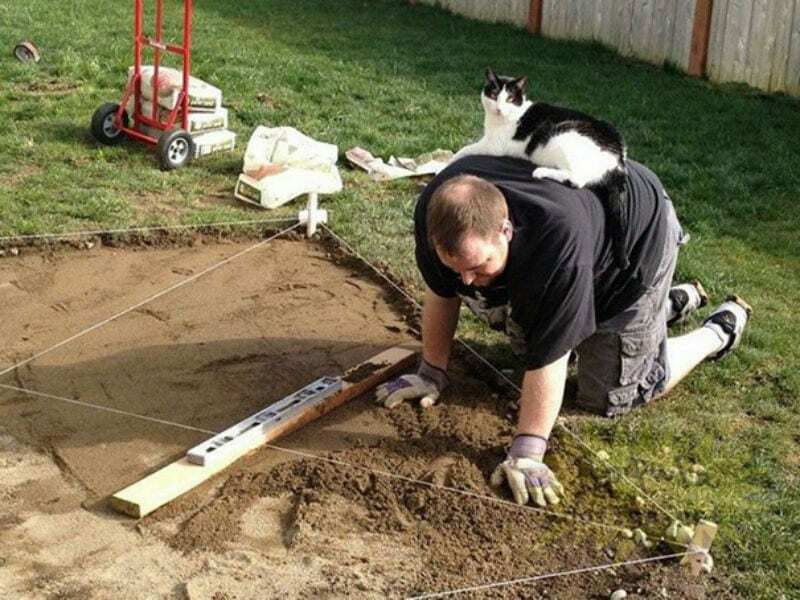 Most of the time, our cats just want to lend a helping hand… or a helping paw. Although this can be a little annoying (okay, really, really annoying) we appreciate the thought. After all, it is the thought that counts. 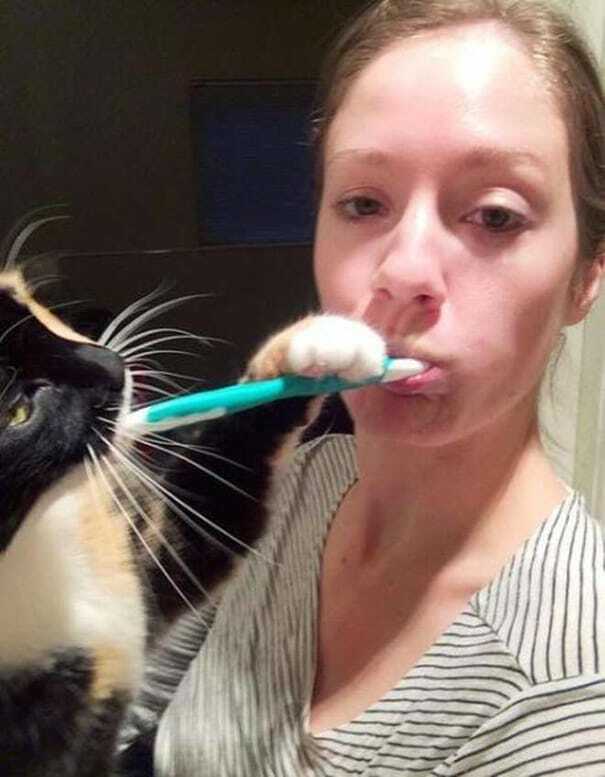 Some cats really want to look after their owners, and some even want to help them clean their teeth for them! Although judging by their own personal mouth hygiene, we’d recommend brushing your teeth again after they’ve helped you out. You know, just to make sure. Okay, so this kitty isn’t really a soft kitty, warm kitty – but it definitely is a little ball of fur. 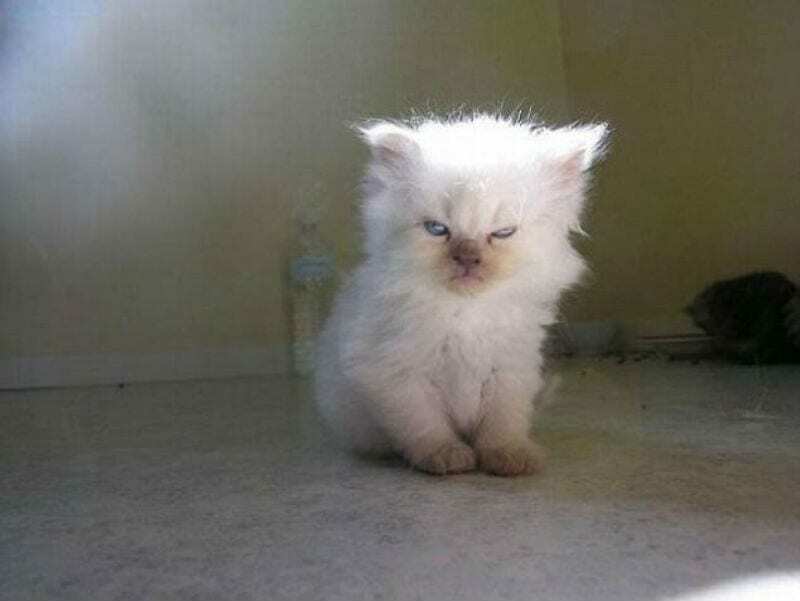 However, we can’t blame this little guy for looking as if he’s woken up on the wrong side of the bed. With increasing rent prices, climate change, shortages of food and the threat of nuclear war, it’s a pretty tough world out there for a little kitty. We’d be the same if we didn’t know how to use a comb. It’s no secret that when you bring a cat into your home, you’re signing an imaginary contract. In this contract, you sign away your whole life; because if you look comfortable, the cat will sit on you. It’s inevitable. It doesn’t matter what you’re doing, where you are or if you’re in the middle of a big DIY project – you are there to serve your cat. So look sharp, look comfortable, and stay like that for a few hours while they nap. That’s a good human. There are three things that cats love above all else; their owners, sleep, and food. However, sometimes this love varies in its order – especially when it comes to food. Sure, they want their owner to survive and eat their own food, just as long as they feed the cat first. This guy is making that pretty obvious. Or maybe he’s just found another unusual spot to fall asleep. We can never really tell, but we wouldn’t be surprised. Let’s be honest; there is just no way you can get any job done when there’s an attention seeking cat in the house – because they will not let you do anything. 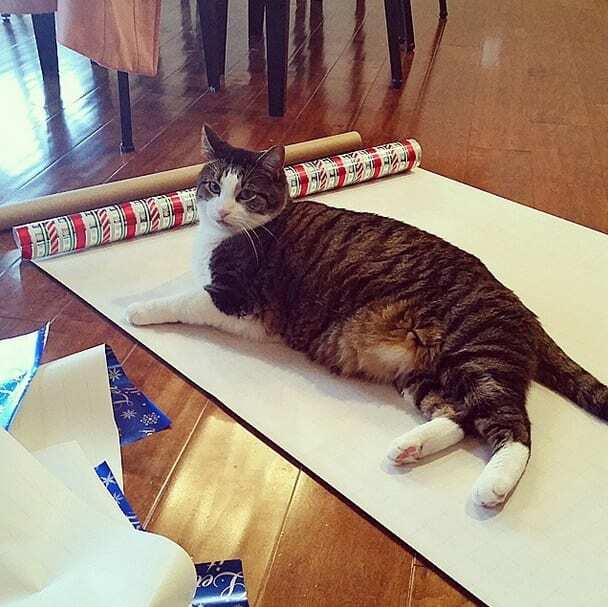 This can prove slightly problematic when it comes to Christmas presents, as there’s just no way to wrap them… unless you want to send your Great Uncle a cute yet slightly annoying cat. And don’t even get us started on birthday presents. Absolute carnage. As we’ve already seen, cats will use anything as a sleeping post. And we really mean anything. But cats are also smart – they’ll try and incorporate all of their favorite things in one. They want to be close to you and have attention, they want a comfortable sleeping spot, and they want a warm surface. These ideals point to one end goal – the human face. Yes, you might wake up with a hairball in your mouth, but your cat had a good nap, so that’s all that matters.